Stellenbosch University developed from the inauguration of the Theological Seminary of the Dutch Reformed Church in 1859, as well as the establishment of the Stellenbosch Gymnasium in 1866. On 6 November 1886 the Victoria College, a new college building, was unveiled and expanded into various facilities in subsequent year. Under the 1916 University Act of the Union of South Africa, and through a donation of £100,000 by a Stellenbosch philanthropist, J.H. Marais of Coetzenberg, Victoria College became Stellenbosch University on the 2nd of April 1918. At present the university accomodates around 30 000 students in ten facilties across five campuses: AgriSciences, Economic and Management Sciences, Medical and Health Sciences, Engineering, Military Sciences, Arts and Social Sciences, Science, Education, Law and Theology. Stellenbosch University has inextricable ties to the formulation of Apartheid Ideology and the formalisation of Afrikaans as academic language, and was thus central to the cultivation of Afrikaner Nationalism in the 20th century. Between 1919 and 1978 each South African prime minister had been an alumnus of the university either as student, professor or chancellor, a list including Jan Smuts, JBM Herzog, DF Malan, JG Strijdom, HF Verwoerd and BJ Vorster. When the current Arts and Social Sciences Building was erected in 1974, it was named after BJ Vorster, a name utilised until 2002. The building itself was erected on mid-campus, an area formerly called ‘Die Vlakte’, from which Coloured and Black communities were forcebly removed under the Group Areas Act between 1964-1970, with several sections of this land consequently acquired by the university. Amongst the buildings occupied during this period was the former Lückhoff School, the first Afrikaans secondary school for Coloured children in the Boland, which opened in 1939 and was considered the heart of Die Vlakte. On 30 October 1969 learners of the Lückhoff School had to carry their desks to a new school building in Idas Valley. The present building houses Stellenbosch University’s Community Interaction Division and Matie Community Serivce, and since 2008 a permanent photographic display commemorating significant pupils of the Lückhoff School and community figures from Die Vlakte is shown in the building. Other iniquities occurred before the institution of Apartheid – on 27 June 1940 students from Dagbreek Men’s Residence (formerly John Murray House) engaged in “Die Slag van Andringa Straat” in which homes on Die Vlakte were attacked by Whites. On the 11th of June 1977 Stellenbosch University shifted their acceptance policy to include postgraduate Coloured, Black and Asian students, as well as non-white undergraduates for degree courses not presented at the then Coloured, Indian and Black Higher Education Institutions, which came to existence through HF Verwoerd’s the Extension of University Education Act of 1959. However, due to the preservation of Afrikaner Nationalism, and its attendant ethno-linguistic rhetorics at the university with Afrikaans as language of instruction, the university has until the late 2000s been slow to diversify and transform the racial demographics of its students and staff. On the 29 May 1997 South African Minister of Education Dr Sibusiso Bengu stated that Stellenbosch University could not persist in being an exclusively Afrikaans medium university, particularly given new governance on inclusivity across tertiary eduction. The university has since tried to adopt various measures to support bilingual and multlingual learning and literacy, including an extensive translation facility and translation and real-time interpretation devices in classrooms, to lectures being presented predominantly in English, or at least in dual-medium. Many feel that the university should maintain its teaching in Afrikaans due to the majority of speakers of the language being Coloured people in the Western Cape. In early 2015 the collective of students, staff and faculty called Open Stellenbosch emerged at the university with aims to address decolonisation, language policies, purging oppressive legacies of Apartheid, accessibility to all South Africans, and making public the experiences of Black students and staff at the university, which included creating a documentary film uploaded to Youtube called Luister (‘Listen’). 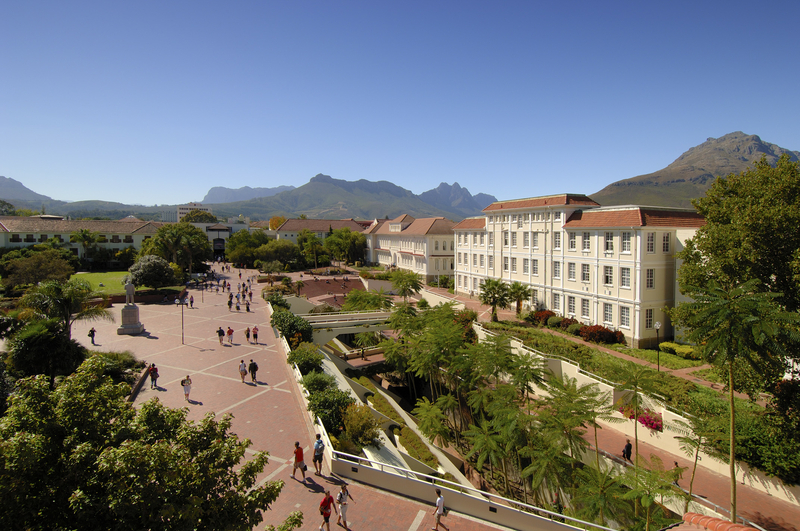 Since 2017 a new Language Policy under guidance of the Language Revision Work Group has been implemented as approved by the Senate of Stellenbosch University, ensuring that no student is to be excluded in learning or teaching from the academic offering based on the student’s command of Afrikaans or English through what the university terms “equitable access” as opposed to the previous mandate of “equal offering”. Furthermore, through the drive of the Department of African Languages, isiXhosa will be introduced into selected disciplinary domains in accordance to student needs.